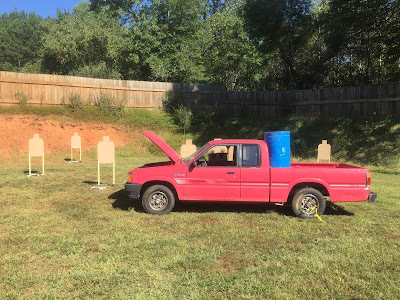 The monthly Rivanna IDPA match in Charlottesville was held this weekend. After several practice sessions this past month, I was looking forward to getting to a match. Unfortunately the benefits of my practice didn't quite show themselves at this outing. The first two stages were stand and shoot stages, with lots of non-threats and reduced target zones. Stage 1 had seven targets; the front three offering essentially head shots only, the rear four visible between the front non-threat targets. Unfortunately I hit two non-threats trying for the rear targets. Not a great start to the match! 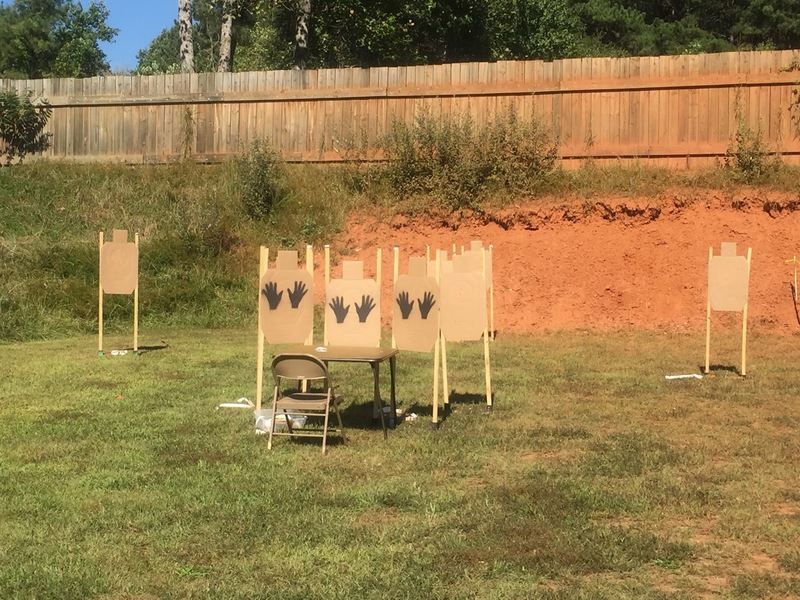 The five targets on Stage 2 all had copious amounts of hard cover, and required three shots on each. I spent too much time getting the hits I needed. The third stage of the match got us into the scenario stages with a card game scenario. We started seated at the table holding playing cards in our hands. There were three "friendlies" right in front of the shooter, and six targets to be engage near to far. 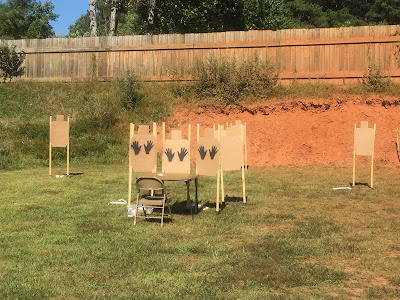 All shooting was done while seated, and required leaning back and forth to see all the targets. I was happy on this one until I saw the SO leaning to look closely at one of the far targets; apparently I went too fast and had a miss, although given the narrowness of the gap we were aiming through, I'm not sure how I missed but didn't hit the non-threat! The final stage had us shooting around, and through, a vehicle. 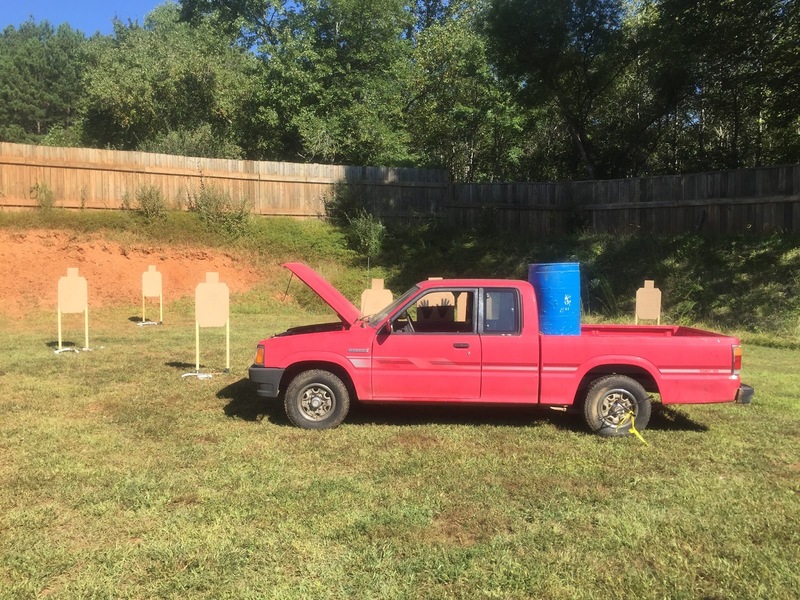 Starting leaned over with hands on a tire iron, there were three targets to be engaged over the bed of the truck. Moving towards the front of the vehicle, two targets were engaged through the cab. Another target was shot over the front, before engaging the final two shooting under the open hood. There was a lot of joking about shooting out the side mirror or the hood support rod, but it was a very fun stage. It seemed I finally was "warmed up," with just three points down on the stage. I had found my rhythm, but unfortunately there were no more stages to shoot. Despite a disappointing finish, it was still a fun match. A day on the range beats a day off the range anytime. In going over it in my head on the drive home, I hit on a couple of things I was doing wrong and need to work on. Nothing like picking up new bad habits! So now I have an excuse to get out and hit the local range for more practice. I did however get home in time to make it to the Fredericksburg Oktoberfest at Blue & Gray Brewery. That's a pretty decent consolation prize.